sible that no deaths occurred from starvation which could have been avoided by any exertion or arrangement on his part or that of his subordinates." The first cholera pandemic began in Bengal, then spread across India by 1820. 10,000 British troops and countless Indians died during this pandemic. 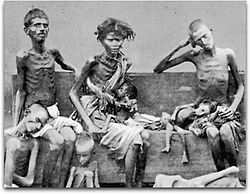 Estimated deaths in India between 1817 and 1860 exceeded 15 million persons. Another 23 million died between 1865 and 1917. The Third Pandemic of plague started in China in the middle of the 19th century, spreading disease to all inhabited continents and killing 10 million people in India alone. Waldemar Haffkine, who mainly worked in India, became the first microbiologist to developed and deploy vaccines against cholera and bubonic plague. In 1925 the Plague Laboratory in Bombay was renamed the Haffkine Institute. Fevers ranked as one of the leading causes of death in India in the 19th century. Britain's Sir Ronald Ross, working in the Presidency General Hospital in Calcutta, finally proved in 1898 that mosquitoes transmit malaria. In 1881 around 120,000 leprosy patients existed in India. The central government passed the Lepers Act of 1898, which provided legal provision for forcible confinement of leprosy sufferers in India. Under the direction of Mountstuart Elphinstone a program was launched to propagate smallpox vaccination. Mass vaccination in India resulted in a major decline in smallpox mortality by the end of the 19th century. In 1849 nearly 13% of all Calcutta deaths were due to smallpox. Between 1868 and 1907, there were approximately 4.7 million deaths from smallpox. Sir Robert Grant directed his attention to establishing a systematic institution in Bombay for imparting medical knowledge to the natives. In 1860, Grant Medical College became one of the four recognised colleges for teaching courses leading to degrees (alongside Elphinstone College, Deccan College and Government Law College, Mumbai).